PESTUK deal with many call outs to treat these insects every month. They are a common pest commonly associated with unhygienic conditions which is not the case. This is due to increased travel across the world, and use of second-hand furniture. Hostels, hotels, holiday camps and blocks of flats are ideal breeding grounds. Bed bugs on holiday can be a nuisance and if brought home with you can cause further problems. PESTUK recommend that a professional treatment is completed to deal with bed bugs. As parasites bed bugs feed on the blood of humans. They can go into a dormant state for up to a year when no food source is available to them. The bites of these creatures are red, irritating marks or lumps on the skin. Not everyone reacts to the bites, and a couple sharing a bed can have one person with signs of bites and the other person with no visible signs. When arriving at your holiday destination take a few minutes to inspect around the beds for signs of bed bugs. Place your suitcase on the stand usually provided and not on the bed. Check the bed frame and the mattress for any small black or dark brown dots, these are signs of their excrement. Other places to check include skirting boards and bed side drawers. If bed bugs are brought home then we recommend a insecticide treatment to deal with them. There is some preparation that must be done before any treatment to ensure success. Treatments will only work if preparation has been done correctly. Bed sheets and curtains must be removed and washed. The rooms to be treated must be vacuumed and cleaned. Drawers and wardrobes must be emptied and clothes only re introduced to the rooms once they have been washed or tumble dried.The treatment will fail if the room is full of clutter. The rooms must be clear of toys, books, boxes, CDs, posters etc. Be careful not to put any of these objects into other rooms as you may spread the infestation. Objects in the room that cannot be either washed, tumble dried or sprayed with the insecticide (books, shoes, cd’s, dvd’s etc) must be put in a freezer overnight. 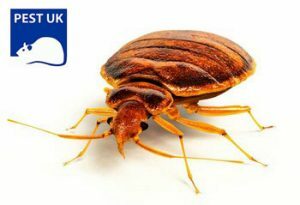 For advice on bed bugs and other pests and professional pest control companies we recommend contacting the BPCA, they are the governing body for pest controllers in the UK. PESTUK are full members and our technicians are fully trained and insured to treat all pests. We have offices ranging from Oxford, Reading, Salisbury, Shepperton and St Albans.